Learn how to buy MUT Coins through our extremely quick, simple and cost effective system. We'll show you how with our step-by-step guide! Please note: As you proceed through the buying process, our automated system will help guide you through the procedure by providing instructions on what to do at each stage. If you require any further assistance, then please don't hesitate to contact our live chat support team in the bottom right corner of your screen where a friendly agent will be on call to help. 1. Firstly, please select which platform that you play Madden Ultimate Team on between the; PlayStation 4, Xbox One and PC. 2. Once selected, the respective platform page will load with a quantity slider that lets you choose how many Madden 19 Coins you wish to buy. As you change the quantity slider, a new price is given in real-time. It is also worth noting that the more MUT Coins you choose to buy, the cheaper the cost per coin is. 3. After you have chosen the amount of Madden Ultimate Team Coins you wish to buy from our MUTStore, we will next ask you to list any valueless player on the auction house for us to purchase. This is how we transfer the coins from our MUT account to yours. 4. 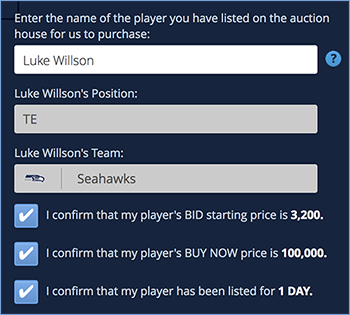 Once your player has been submitted to the auction house, please return to our website where you will be prompted to input the name of the player you have just listed on the market. We use these details to later search, identify and purchase your player from the auction house and thus, accrediting your account with the same amount of MUT 19 Coins you've chosen to buy. 5. Next, you will enter our highly-secured checkout stage that's encrypted by Comodo's highest bit-rated SSL. On this stage, you will be asked to input your billing details and choose to pay through one of our worldwide known payment gateways - PayPal or Skrill. 6. As soon as your order has been paid for, our automated system instantly begins to search the auction house for your designated player before swiftly ending the auction by purchasing it through the buy now feature. Thus, immediately transferring the MUT Coins into your account. All you need to do then is leave and re-enter the Madden Ultimate Team game mode and you will have your cheap MUT Coins! 7. Begin to spend your well-earned Madden 19 Coins by assembling your dream roster! 1. Access the Sell MUT Coins page and select which platform your Madden 19 Coins belong to - PlayStation 4, Xbox One, or PC. 2. Next, input your contact details and the quantity of Madden Ultimate Team Coins you wish to sell via the contact form. 3. A MUTCoins.com adviser will contact you within usually a few hours with a quote on how much we can pay for your MUT 19 Coins. 4. Once the trade has been agreed, we will list a player on the auction house for you to purchase from us. As soon as the player has been listed, we will email you back with the details of the player so you know which to buy. 5. The very moment that our player has been purchased, we immediately release the funds into your designated PayPal account. The money will be sent via the 'friends and family' option which means that you do not incur any unnecessary fees! if at any stage before your Madden Coins have been delivered, you are entitled to request a full refund at any point. This can be achieved through the Contact Us page whereby an adviser will process your refund request immediately back into the account that you bought the MUT Coins from. If any Madden order is undeliverable and we cannot contact you via email, then we will automatically process a refund on the 7th day after the transaction was made. Once your Madden Ultimate Team Coins have been delivered, there are no refunds available thereafter.